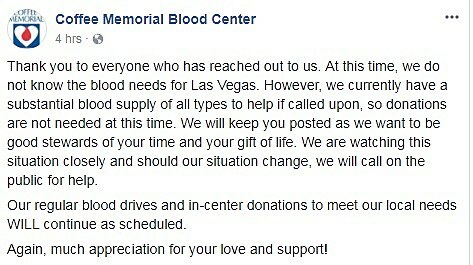 After the tragic events that happened last night in Las Vegas, Coffee Memorial Blood Center started to get lots of calls and messages on Facebook by good people wanting to help. Coffee Memorial released this statement via Facebook. A lone gunman shooting from a hotel room in Las Vegas Mandalay Bay killed more than 50 concert-goers and injured more than 400 Sunday night at the Route 91 Harvest Festival. Read more of the story by clicking here.